Just happened to check on to Gold as it seems there is an important move here. In the previous update had mentioned about 960 being a resistance for the upmove and may not cross 980 in short term. 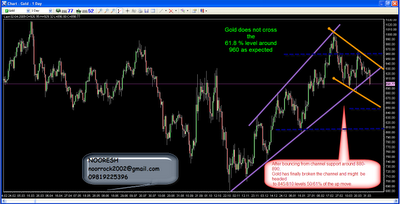 Gold made a high of around 965 odd and cooled of as expected. Also before that had mentioned about the crucial support around 880 which did hold up. The last move below 900 might have trapped lot many shorts and we saw a quick move back to 960 as the channel was not broken and neither was our level of 880. Now this time around the channel has been broken clearly and a drop below 880 would spell doom for the gold diggers and expect a retracement of the entire upmove from 680-1000. 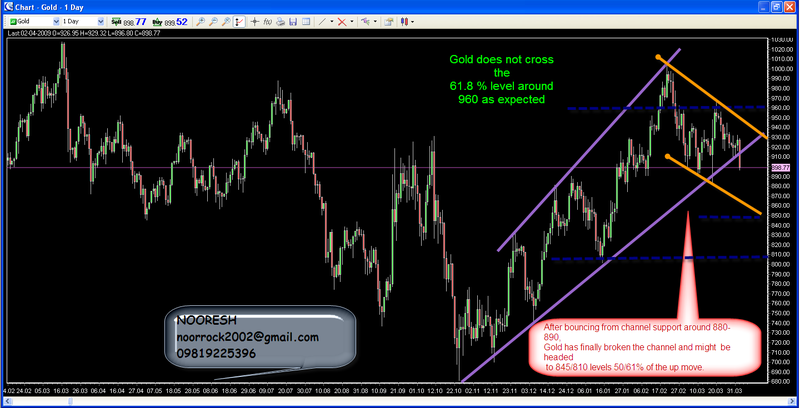 Fibonacci levels of 50/61 % come roughly around 845 / 810. Strong technical supports placed around 800-820 zone. Could be a good short trade below 880 or on rise to 920 with a stop beyond 935.